Colorful caterpillars have already begun their season long feasting on Wakulla County foliage. The gnawed-off leaves are a good clue they are on site. The bright colors of spring’s blooms have settled into the comfortable shades of early summer. While spring’s brilliance stands in stark contrast to winter’s muted tones, summer has as an easy and inviting appearance. Still there are splashes and patches of bright foliage in all parts of Wakulla County. Tropical sage, for example, add red flowers to the green backgrounds all across the area. The insect residents are doing the same thing, but in less concentrated splotches. Colorful caterpillars are currently preparing to become butterflies and moths. 2017 is likely to be a good year for caterpillars. Last winter was relatively mild so a minimum of eggs were lost and the spring has been sufficiently moist to promote the growth of plants necessary to feed the plethora of these soon-to-be flying artworks. 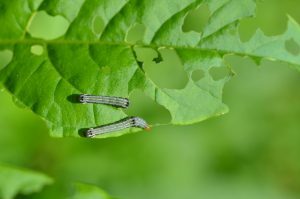 It is important to understand most caterpillars feed on a specific and narrow range of plants, in some cases only one type of plant. With few exceptions, they are not the Biblical plague which strips the landscape bare of all plants and trees. The exceptions, such as armyworm and cutworms, quickly attract the attention of gardeners, ranchers and flocks of birds which react accordingly. These multitudes of nascent moths and butterflies are a nuisance because they are attracted to vast quantities of a crop monoculture and they will reproduce quickly. Fortunately there are other caterpillars with much better reputations, at least in Wakulla County. One is the orange dog caterpillar which can be a problem in Florida’s orange producing region given its exclusive diet of citrus leaves. As a means of camouflage the mature caterpillar resembles bird droppings, dingy brown and olive green with large white small purple patches. They also have red osmeterium or horns which they project when threatened, emitting a foul odor. From this incongruous appearance, this caterpillar transforms into a giant swallowtail butterfly. Its wingspan reaches four inches with a distinctive black and yellow pattern. The saddleback caterpillars are mainly green with a brown area at both ends, and a prominent, white-ringed brown dot in the center which resembles a saddle. To add a bit of freakishness to their appearance, they have well place defensive spine which can inflict painful stings. This “punk rock” appearing caterpillar can be found in variety of foliage as they feed on a large selection of plants. The moth produced are a non-descript dark brown and stout-bodied. The whitemarked tussock caterpillar favors the area’s oak trees. Its four white tufts are carried on its back and offset the black horns and tail. The bright red bulbous head is located just below the black horns and is in stark contrast to the remainder of the body. Their hairs are a noted allergen for any unlucky person who contacts them. All of these and many more caterpillars are active in Wakulla County in June. Caution is advised because some do produce a sting, but at least they are highly visible.